PetSmart, Inc. is the largest specialty pet retailer of services and solutions for the lifetime needs of pets. operates more than 1,269 pet stores in the United States, Canada and Puerto Rico, over 195 in-store PetSmart provides a broad range of competitively priced pet food and pet products; and offers dog training, pet grooming, pet boarding, PetSmart Doggie Day Camp SM day care services and pet adoption services. Since 1994, PetSmart Charities, Inc., non-profit animal welfare organization and the largest funder of animal welfare efforts in North America, has provided more than $165 million in grants and programs benefiting animal welfare organizations. Through its in-store pet adoption partnership with PetSmart Charities®, PetSmart has helped save the lives of more than 5 million pets. Part of the fun of being a pet owner is driving your pet up a wall by dressing them up usually against their will. We recently had the opportunity to irritate a few four legged friends by dressing them up, we received a cute Halloween costume from PetSmart and instead of trying to dress our cat we took the fun up to my grandmother's since she lives with a couple of wieners....of the canine variety. I'm glad we decided to play dress up with the dogs instead of our cat, he'd tear us up if we tried to dress him. Thankfully my grandmother has a boy and girl dachshund since we were given a costume that would work with both boys and girls. First up was our little girl, she was going to go out as a fish, not just any fish she is going to be Disney’s Nemo this year. This outfit is too cute, it is colorful and fits nicely. Mr. would not let us put on him at this current time. I guess he is not in the Halloween mood as of yet, but I am sure he will look great on Halloween night. Instead Mr. got to play with an adorable doggie toy, that was a Snoopy all ready for Halloween. Mr. had a great time toting the toy all around the house and playing catch with it. I remember bringing my daughter around trick or treating around the neighborhood many times. Of course I remember what my daughter is every year, but I find it hard to remember what other kids from the neighborhood were? For some reason I can remember what each of the little doggies in the neighborhood wore! Perhaps it is because the dogs are so very cute and unique, I still remember there was a dog and owner combo costume once. The owner was dressed as the old witch from Disney’s Snow White, and the tiny tiny puppy was dressed as Snow White! That was the cutest thing I have ever seen… the kids seemed to be much more interested in the dressed up dog than the candy, and my daughter still remembers this dog from years ago. Why not make some memories with your special furry pal this Halloween season, with a cool dress up costume from Petsmart. 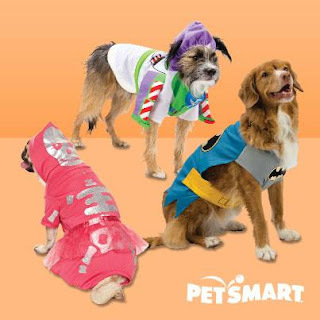 PetSmart has a great variety of costumes, from Disney costumes to classic favorites for your pet. The costumes come in a great variety of sizes as well, from Xsmall to XXLarge. So all pets can get dressed up this year, well except my cat, he just would not stand for it. So if you are looking for some great pet supplies and accessories, and of course costumes Petsmart has such a great variety make sure to shop now. 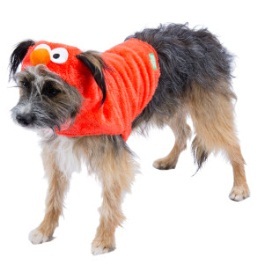 Whether you are a Nemo fan, an Elmo lover Petsmart has a great costume for your pet. 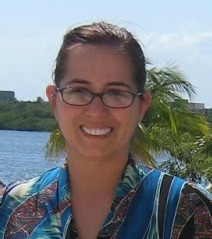 The generous folks at Petsmart are giving readers of Susan’s Disney family a chance to win too! Would you like to win a $25.00 Gift Card to Petsmart? You could use this to purchase some great costumes, or whatever you need for your pet. Would you like to win? Please visit the PetSmart site, and take a look around then come back here and tell me what costume for pets is your favorite? There are also other ways to enter, please enter below. Disclosure: The reviews and or opinions on this blog are my own opinions . I received 1 costume and a dog toy to review. No monitory compensation was received. I was not required to write a positive review. Your experience may differ. The opinions I have expressed are my own I am disclosing this in accordance with the Federal Trade Commissions 16 CFR Part 255: Guides Concerning the Use of Endorsement and Testimonials in Advertising . I love the Disney® PetHalloween™ Tigger Costume! I love the Disney Nemo costume for dogs!!! I think the Bat Wing Harness for dogs is super cute! I love the Disney PetHalloween Pooh Costume. These are so cute! I've never dressed up my dogs for Halloween, but I think I might this year. I liek the cat cowboy costume! I love the woody costume how cute! The Grreat Choice™ Jockey Costume is pretty cute. my cat would hate the Grreat Choice® PetHalloween™ Clown or any costume for that matter, but i love it. 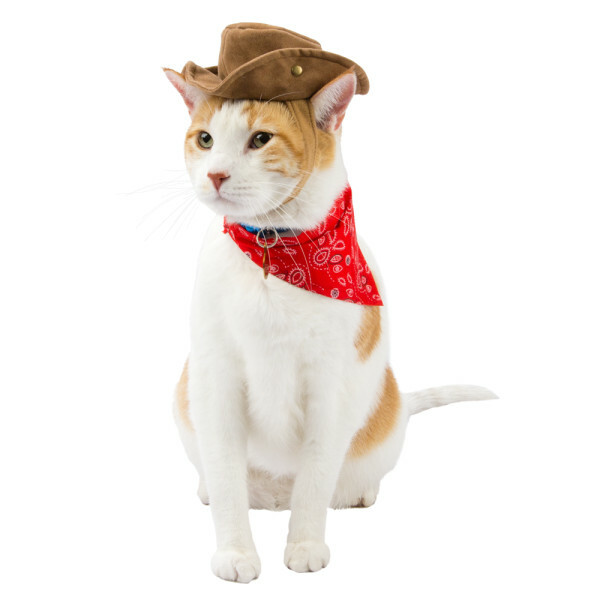 I love the cowboy cat costume, but my cat would kill me! 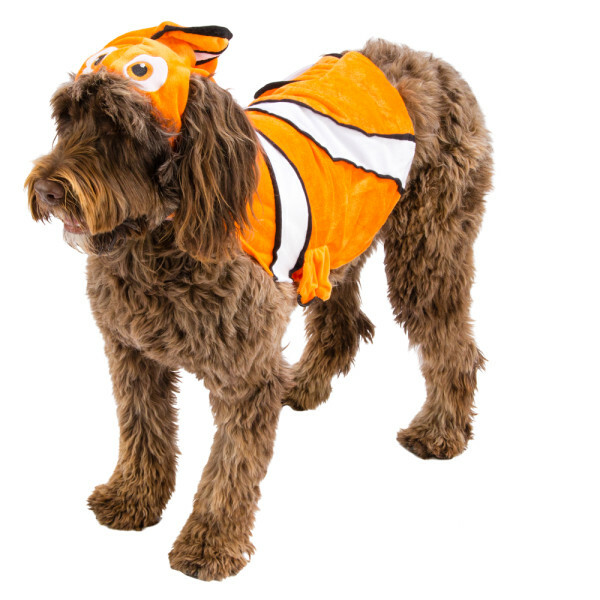 I love the Disney Little Nemo costume for dogs! Thanks so much for the fantastic giveaway! I like the Top Paw pet Halloween bee costume! 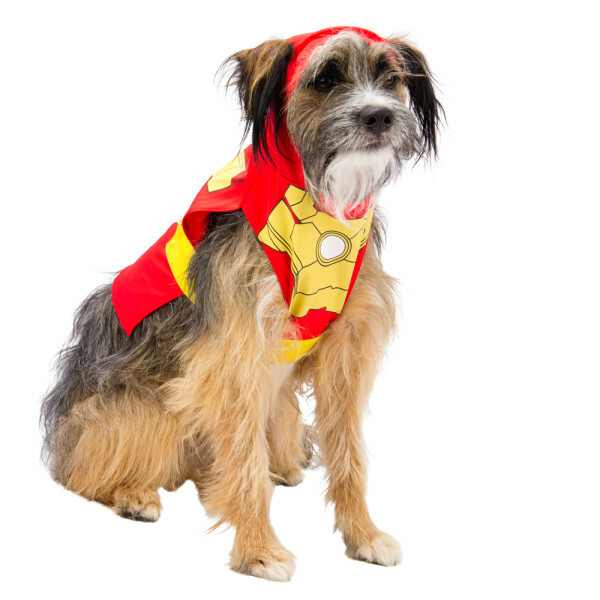 My fav is the Top Paw® PetHalloween™ Spider Costume - and both my dogs could get one! I like the Eeyore costume and the Martha Stewart Pirate costume. I love the Peanuts costume - thank you. I like the Jockey Costume. Haha I love the cowboy costume, how adorable! I like the pirate dog costume. My dog lost her eye this year because she was hit by a car so this would be Parrrrfect. I love the Top Paw Disney Pooh Sweater. I love the pumpkin costume. My Issabell is all black so she would be wonderfil as the devil!!!!!!!!! I like how their faces are framed by the head pieces. I love the bee costume. I want the eeyore costume for my dog! too cute! I love the Martha Stewart Pets Blue Dragon Costume! i just love the variety of pet costumes. ive dressed my cats up last year and they didnt like it to much but the costumes are super cute and the cats in them are adorable. I like the Martha Stewart Pets Pirate Costume. I love the Grreat Choice® PetHalloween™ Angel Wings, these would look adorable on my dog Saydee. The Minnie costume is cute. The Batman costume . .my pup already thinks he is bat dog! I love the Batman costume! The Tigger costume is adorable!! The buzz light year costume is pretty dang hilarious! I love the Top Paw® PetHalloween™ Cow Costume, it would be fitting for my Chihuahua because she already looks like a cow lol. I like the Pirate Hat costume for cats. I really love the Kitty Cowboy costume! I love the Top Paw PetHalloween Bee Costume. I like the pumpkin dog hat. I like The Black Cat Costume for dogs!! I love the Martha Stewart Pets Pirate Costume. I love the alligator costume! Did you see the Wonder Woman!!!??? That is going to happen this year. Thanks! My cat needs the Grreat Choice PetHalloween Princess Hat because she is a princess. I love the pirate hat for cats. My little black Pomeranian would look adorable in the little witch costume! Martha Stewart Pets® Snowman Costume.